Co-published with Birlinn Ltd (also available as an e-book). Contact 01381 668 4371for orders. 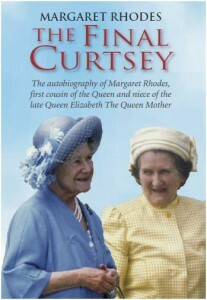 Margaret Rhodes was born into the Scottish aristocracy and royalty often came to stay and she spent childhood holidays in Scotland with her cousins Princess Elizabeth and Princess Margaret. In the Second World War years she ‘lodged’ at Buckingham Place while working for MI5. She was a bridesmaid at the wedding of her cousin Princess Elizabeth to Prince Philip. Three years later the King and Queen attended her own wedding: Princess Margaret was a bridesmaid. In 1990 she was appointed as a Lady-in-Waiting to the Queen Mother, acting also as her companion, until her death in 2002. A fascinating account of a special life, with the author’s family relationships to nobility and royalty, her long and special marriage, her children and grandchildren and a life lived to the full. 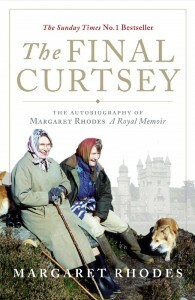 The Final Curtseyby Margaret Rhodes, a cousin of Her Majesty The Queen and niece of the late Queen Elizabeth The Queen Mother, is a publishing sensation. Sales have already reached 25,000 copies in hardback, appearing on The Sunday Times bestseller list. It has been serialised in the Mail on Sunday in three extracts: had a major feature in Hello! Magazine; been serialised in all major countries including Paris Match; and had extensive TV, radio and book reviews and interviews. It was reprinted before publication and has had strong sales with book shops, wholesalers and Amazon.